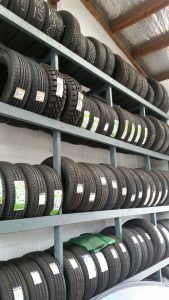 We have a full range of tyres right here in our Bell Block based workshop. Our tyre fitting and balancing equipment is very modern and we can quickly have the correct tyre fitted to your vehicle. If you think that your tyres may not be safe, call by and we will check them while you wait. If you have the inconvenience of getting a puncture call by and we will get the damaged repaired as good as new. When it comes to choosing what tyre is right for your vehicle we can help you make that choice. We have a range of top end tyres right through to more affordable tyres that could fit your budget. Our wheel balancing machine can balance your vehicles wheel to within 5 grams of balance. We can also provide help with tyres that are on your farm bike, wheelbarrow or quad bike.